St Louis gym flooring is the most durable and versatile multi-purpose flooring on the market. We offer wood and rubber gym flooring perfect for residential home, commercial, and school applications. Construction and installation for this amazing indoor and outdoor product is quick and easy, leaving you with athletic flooring you'll enjoy for years to come. Looking for durable rubber gym flooring for residential or commercial use? Our St Louis gym flooring is perfect for indoor and outdoor use, and is built for a long life and multiple uses. 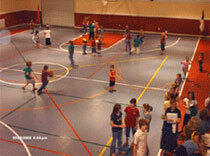 Enjoy a multitude of activities on this fun and durable sports flooring. Multi-purpose is the name of the game with our rubber gym flooring. You won't find an indoor and outdoor surface that offers more in the way of versatility and durability. Residential homeowners and commercial entities alike have come to know the benefits of this state of the art sports flooring firsthand. Learn more about how our St Louis gym flooring can be a game changer for you. HOMECOURT SPORTS also offers rubber flooring for workout or aerobic rooms. Our rubber flooring is available in interlocking tiles, sheets, or rolls, and can easily be installed over existing concrete or any hard surface. Our rubber flooring is the answer to your special purpose and fitness flooring needs. The rubber floor will absorb impact, look great, and last a long time. The non-slip surface is easy to clean and maintain, and will be your flooring solution for many years to come, and it comes with a 20 year warranty.